Build Your Game! 365 Days of Instruction, Motivation and Insights for Pool Players is like having a professional coach in your corner—every day of the year! With an easy-to-use format, this beautifully designed book focuses on one specific topic relating to pool playing excellence every day. Build Your Game! is an amazing, one-of-a-kind book that will build your competitive pool game and increase your pool playing skills. 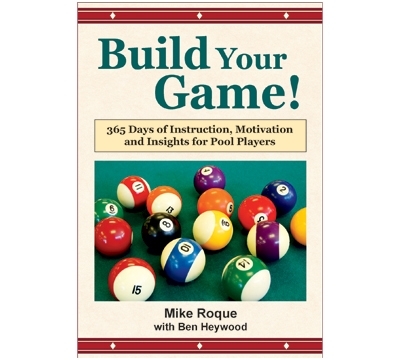 Written by Mike Roque, with Ben Heywood, Build Your Game! is a road map to playing at your highest level with confidence, a precision stroke and a strong mental game. Every day starts with an inspiring quote from great pool players, instructors and various writers, sports legends and world class figures. This is followed by a comprehensive look into the topic of the day and ends with a concise summary statement. Win more matches by maximizing the value this book has to offer! Practice makes perfect, so keep it in a place where you will use it daily. Read, reread and contemplate the daily topic— the more often, the better! This helps you absorb and fine-tune the material to your pool game. The deeper your understanding, the more it becomes part of your inner "filing system" and will be there for you when you need it most—during a match! Published by Bebob Publishing, Build Your Game! is a must have for every pool player. Includes a comprehensive index, quote sources and reference materials. 379 pages.